Brenda Gayle Plummer. 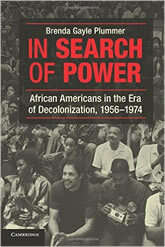 In Search of Power: African Americans in the Era of Decolonization, 1956–1974. Cambridge University Press, 2012. In Search of Power is a history of the era of civil rights, decolonization, and Black Power. In the critical period from 1956 to 1974, the emergence of newly independent states worldwide and the struggles of the civil rights movement in the United States exposed the limits of racial integration and political freedom. Dissidents, leaders, and elites alike were linked in a struggle for power in a world where the rules of the game had changed. Brenda Gayle Plummer traces the detailed connections between African Americans’ involvement in international affairs and how they shaped American foreign policy, integrating African American history, the history of the African Diaspora, and the history of United States foreign relations. These topics, usually treated separately, not only offer a unified view of the period but also reassess controversies and events that punctuated this colorful era of upheaval and change.